I like corn because it’s pretty. Obviously, since I’ve noticed that, it makes me completely superficial. Other grains don’t do it for me. They don’t look like jewels when they’re threshed, hulled, cleaned or whatever you need to do to them to get them ready for eating; corn, however, is in a class of its own. That ear to the left? That isn’t sweet corn – it’s grain corn. Those kernels, though not completely dried yet, are really hard. The color is astounding, isn’t it? Like gold. Sweet corn is for fun: grain corn is for survival. The problem with corn is that it’s become a byword for the evils of modern agriculture. 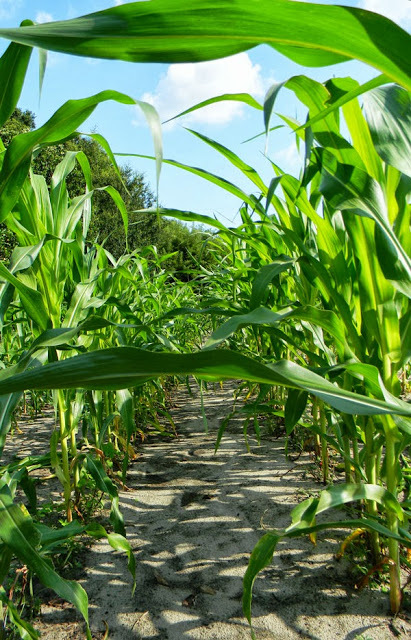 The plant has been used to make evil high-fructose corn syrup and had its genes scrambled into genetically modified variants that can stand being sprayed with poisons that would put us in a coma. 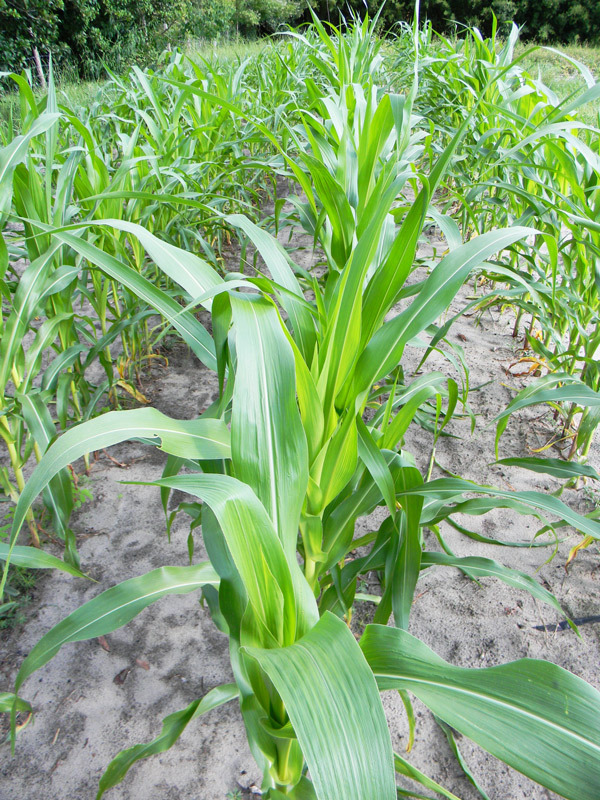 Corn is also a greedy crop that likes a lot of fertilizer as well as disturbed soil. 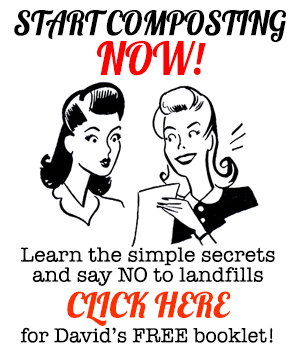 When you grow it conventionally, you end up with erosion, run off, etc. In another negative, corn, when used as a staple (and not nixtamalized), is also linked to pellagra, a niacin deficiency that can make you go nuts. 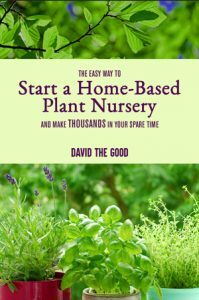 You may even start daily gardening blogs. Corn also has a lot of positives going for it (other than being pretty). Corn isn’t quite as easy to grow in Florida as it is in some states. Sometimes extended rains will ruin some of your crop around harvest time… sometimes the bugs take over… and sometimes a nasty blast of wind will blow all your stalks sideways. Yet even with those drawbacks, it’s usually simple to grow grain corn. Over the last couple of years, I’ve tested five different varieties here in North Central Florida: Hickory King, Tex Cuban, Floriani Red Flint, Green Dent and an un-named flint corn from the USDA germplasm repository. 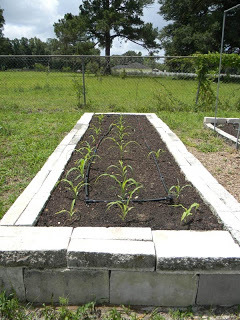 Unnamed flint corn test bed. FAIL! Out of these, Tex Cuban and Hickory King stand head and shoulders above the rest. Both are “dent” corns, and both take a long time to produce. The green dent and the Floriani produced quickly – and poorly. They exhibited small ears with lots of skips, pest problems, less vigor and many stalks that failed to bear anything. The un-named flint corn was a total fail, which I blame on bad seed. In a really good bed they only grew a couple of feet tall and didn’t bother making ears. Heck with that. I’ll give both another try next year, but thus far I am not impressed. Three years ago we had a great stand of Hickory King that produced excellently on tilled soil amended with cow manure. This year I planted Tex Cuban on tilled soil and fertilized it with chicken manure tea and it’s done quite well. The ears aren’t as large as the Hickory King ears, but that may be the result of genetic depression or lower soil fertility in the plot. It’s hard to tell when you don’t grow things side-by-side in the same season. Tex Cuban corn kicking tail. All that stuff aside, grain corn is a lot easier to grow than sweet corn. It’s more tolerant of temperature fluctuations and pests, as well as lower soil fertility. heirlooms. There’s nothing like it. Here’s how I make grits. That’s the fun part. If you pick them in the “milk stage,” they make a decent, full-flavored sweet corn. In the mature stage, other than grits, you can turn the kernels into cakes, chips, tortillas, cornbread and other delicacies. That aside, corn makes for great chicken feed if you “crack” it roughly in your mill so the birds can eat it. Whole kernels can be handled by larger birds, but I’d rather give them easier to handle sizes. Also, if you’re growing your own tobacco, corn cobs make great pipes to smoke it in. Who needs fancy imported briar from some fruity European nation? 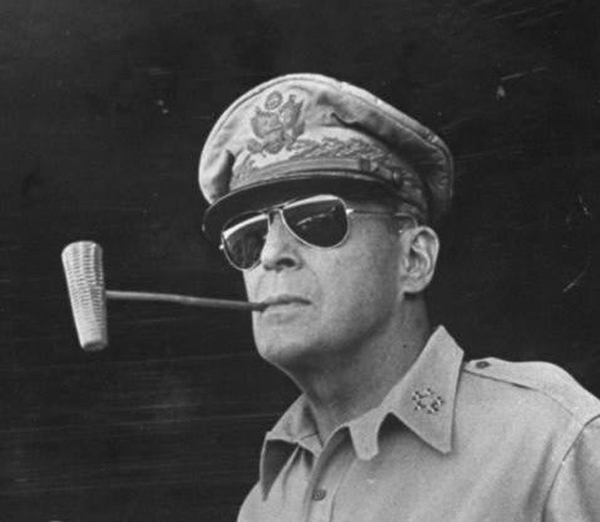 If corn cobs were good enough for General MacArthur, they’re more than good enough for me. Incidentally, if you have them, small bamboo stems make good pipe stems, as do dry elderberry twigs or any other stick you can clean the center pith from. I’ve made my own pipes from various materials… and can attest to the fact that nothing tastes as pleasant as a corn cob. A final note on corn: the stalks are great forage for grazing animals, as well as being a good addition to the compost pile. I stack them on the bottom of a new pile to add air, then pile smaller stuff on top. By spring you’ll have plenty of compost to feed the next crop of corn. If you haven’t tried growing grain corn, give it a go. You might fall in love at first glance, just like I did. Method of preparation: Young ears as a vegetable, mature kernels ground for flour and grits, cobs for smoking pipes. Garden Tools For TEOTWAWKI – the best prepper garden tools! Excellent post! I'll (probably) give corn another go. There are few plants that are more satisfying to grow. You pop them in the ground, they get really tall, then you harvest handfuls of jewels. I’ll be completely unimaginative here and say, as long as I can boil, steam, or BBQ them and eat off the cob, I love corn. Wouldn’t think “seed” corn any different in these respects? 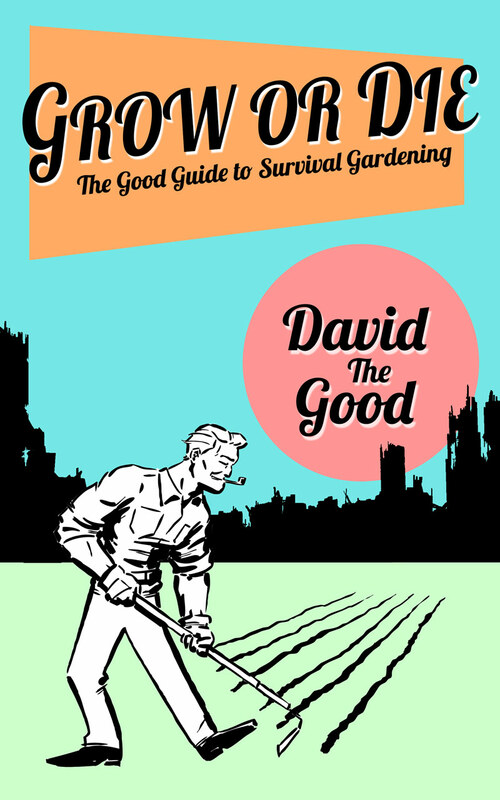 David, where did you get the seed for the varieties that did well for you? Baker Creek is my main source for corn, though I get it from Southern Exposure Seed Exchange as well. The grain corn varieties are good for corn on the cob, but they’re starchy and savory rather than sweet. Any corn with butter and salt is goo, though! I searched the Web and I am not coming up with a source to get Tex Cuban corn seeds. Your link is a bad link. Could you make a suggestion on where to get some? Or do they come with with another name? I don’t think anyone has them anymore. It was an ECHO project in Ft. Myers, I think. You could try calling them. We planted 3.3 acres of reis yellow dent in Marion county Florida this year. Not sure yet how it is going to do. Looks good now. Excellent. Good luck. Dent corn did great for me in Marion county.